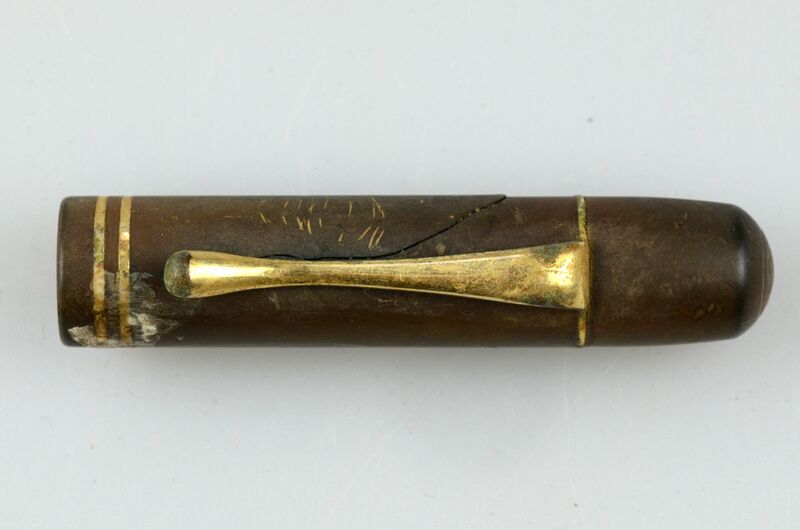 A significant part of the Sobibór collection is constituted by personal belongings brought by prisoners to the camp, including a few remaining fragments of fountain pens. 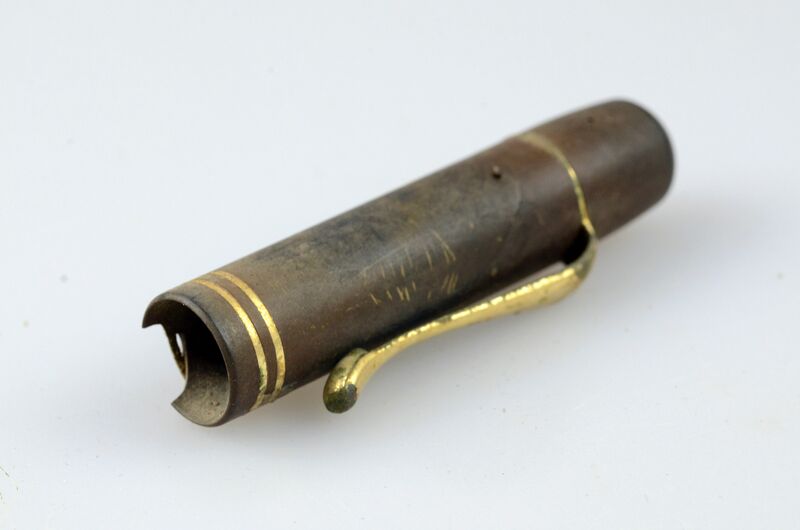 One of such relics is a dark brown cap of the Pelikan pen made from ebonite and ornamented with gilded elements, namely a decoratively profiled clip and two horizontal rings at its slot. The pen is also marked with the Pelikan logo – a schematically depicted pelican feeding its nestlings in the nest, with the following inscription below it: "Pelikan PATENT Pelikan PATENT". The originator of the Pelikan company was Carl Hornemann, a German chemist who invented his own ink colour and began its production on a broader scale. He started his business in Hanover in 1838. The enterprise evolved successively, being initially focused on the manufacture of ink and stationery. It put the first fountain pen on the market in 1929. It was the model 100 with an innovative piston filling system allowing to control its content. It is worth mentioning that a pelican feeding its nestlings in the nest became the symbol of the company in the 1870s. However, the logo was changed many times over the years. A schematically depicted nest with four nestlings fed by their mother was characteristic for the 1920s and 1930s. Significant changes which made the logo even simpler were introduced in 1938, marking the 100th anniversary of the company. 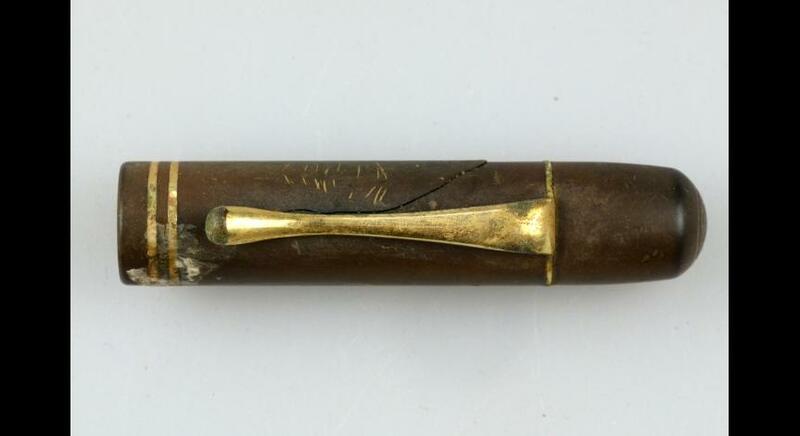 Thanks to this information, a discovered element of the pen can be dated between 1929 and 1938. It is much harder to determine a concrete model of the pen, but most likely it is the first model manufactured by the company – the model 100. However, at the beginning of 1938, the next model was manufactured – it was the model 100N signed at first with an older version of the logo and in 1938 it was signed with the modified one. The precise recognition is difficult as two models are very similar to each other and especially due to the fact that the Museum has only a cap of the pen at its disposal. 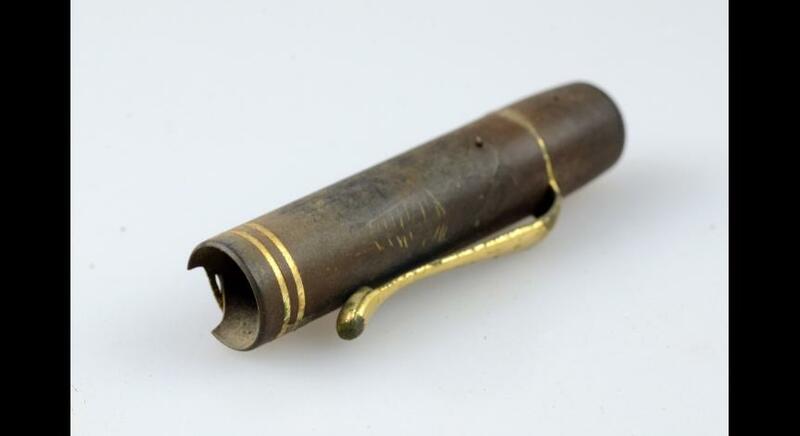 This, however, does not change the fact that it is one of the first fountain pens manufactured by the Pelikan company which has a high collector’s value. The Pelikan company still exists today, manufacturing worldwide known office supplies.